Here we have the recipe for Greek souvlaki - the plural is souvlakia. This can be eaten as a snack or as a filling lunch or supper. It's also very popular with the kids! 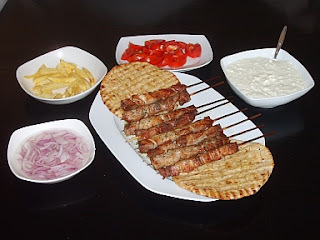 The normal accompaniments to the meat are tomato, onion, french fries and tzatziki. So in addition to the recipe below, you will need to have prepared tzatziki beforehand (see the recipe here) and at some point to prepare some french fries. 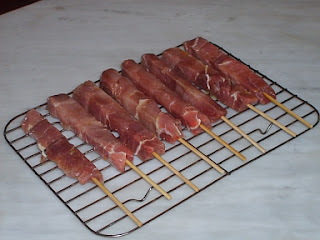 Fix the pork cubes onto the skewers. Place them in a bowl, sprinkle with salt and pepper and then immerse in 60 ml of the oil. Put in the fridge for approx. 1 hour. Remove from the bowl and grill on both sides on a barbecue or in the grill of the cooker. Beat the remaining olive oil (setting aside 3 tbsp before you do so) in a bowl with the lemon juice. Dip the souvlakia in this mixture and then place on a large dish or platter. Sprinkle them with the salt and oregano mixture. Cover them with aluminium foil to keep them warm while you prepare the pita breads. Place the 3 tbsp oil you set aside earlier in a bowl, add the ½ tsp oregano and ½ tsp salt and stir. Brush each pita bread with this and put under the grill. Turn over and brush the other side and grill. Don’t leave the bread under the grill too long as it shouldn’t become hard. Just enough to warm it. 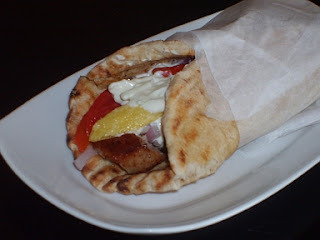 On a table or work surface put the souvlakia, pita breads, tomatoes, onions, French fries and tzatziki. 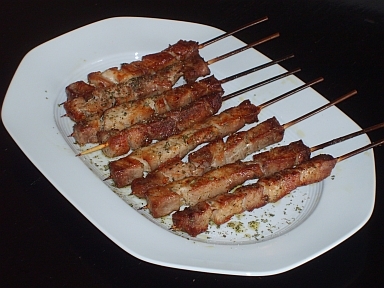 Remove the pork cubes from the skewer and place down the middle of the pita bread. Depending on what each person wants, add tomatoes, onions, French fries and tzatziki. An alternative is to get larger pork cubes and when you put them on the skewers add small slices of green, red and yellow peppers in between the cubes. 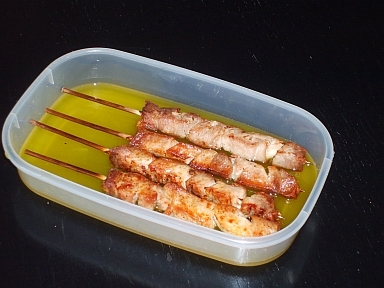 You prepare in the same way, but this is not served with pita bread, but eaten straight from the skewer. This is like something I tried to eat in an asian country I went to. I'm not really familiar with the Greek cuisine but this recipe is so simple and really a food that I will definitely try. Thanks! You're welcome! This can also be a delicious addition to an outdoor barbecue. Enjoy!